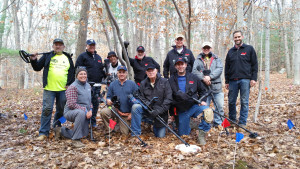 Archaeology at Minuteman Historical National Park: The Parker’s Revenge Project | Skinner Inc.
As a child growing up in the town of Concord, Massachusetts, I have always had a passion for the history and material culture of the events leading up to the start of the American Revolution. Years ago, I began going to local historical societies trying to find new documentation, as well as objects with a solid provenance to this period. Last year, I had the wonderful opportunity to look into the ground and see if we could find the location of the spot that the Lexington militia arrived on the Battle Road on April 19th 1775 to attack the retreating British column on their return from Concord. Left to right back row then front: Jo Balicki, Bill Rose, Corrine Rose, Bill Poole, Ed Hurley, Sheldon Skaggs, Eric Fahey, Meg Watters, Joel Dukes, Doug Scott, Joel Bohy. The archaeological dig, named the “Parker’s Revenge Project” was supervised by Dr. Meg Watters, Project Archaeologist. It began with research as to what the 18th century landscape might have looked like, what buildings might have been in the area, as well as some brush clearing done by numerous volunteers. As we came to the actual metallic survey, Dr. Douglas Scott, famous for his work at The Little Big Horn and many other conflict archaeology sites, worked with us to train the volunteers as well as some of the professional’s on the site. 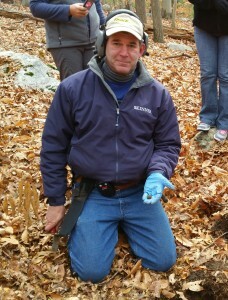 Over three week long surveys, we began to find musket balls that had been fired on that famous day! The thrill to a historian of carefully excavating a good target and finding history is almost indescribable. Every time someone barked out “ball”, the hair would stand up on the back of my neck. Through study under a microscope and weighing the found ball, we were able to distinguish for the most part what ball might have been fired or dropped by a Provincial, and the same with the British regulars. As that was documented and the GPS coordinates were downloaded, there was a distinct patterning that enabled us to have a glimpse into the action that happened on the site some 241 years ago. On Sunday, April 17th from 5:00 PM to 6:30 PM at the Concord Museum, Dr. Watters, along with Minuteman National Historical Park ranger Jim Hollister, and museum curator David Wood will present a lecture about the project called “ Revealing the Past through Modern Archaeology: Parker’s Revenge”. It is a free lecture sponsored in part by the Massachusetts Society of the Cincinnati. I hope to see some of you there! This entry was posted in Blog and tagged allen pepperbox, American Revolution, antique arms, British, cannister, canon, Commonwealth collection, Concord Museum, double barrel, flintlock, French, guns, model, muskets, Napoleonic-era items, percussion pistols, remington, rifle, smith and wesson, socket bayonet, swivel, World War I, world war II by Joel Bohy. Bookmark the permalink.